You are here: Home	> Dehumidification	> What are the differences between refrigerant and desiccant dehumidifiers? Before selecting a dehumidifier unit, it is important to understand the difference between refrigerant and desiccant units. There are several advantages of both products but one may be better suited to an application depending on your particular requirements. 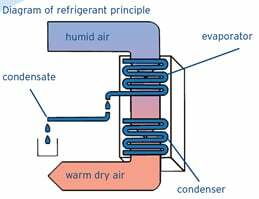 How do refrigerant dehumidifiers work? The way our refrigerant dehumidifiers work is similar way to the way condensation forms on a cold window. A dehumidifier contains a compact refrigeration system which makes it the coldest place in the room. Air is drawn into the cold dehumidifier where any moisture in the air condenses on the hydrophilic coils and is collected into a container. The dehumidifiers are fully self-contained, packaged units which incorporate an air circulation fan and refrigeration circuit. The fan draws room air into the machine passing it firstly across a refrigerated heat exchanger (evaporator). This cools the air, causing the moisture in the air-stream to be precipitated onto the evaporator as water. The electrical driving energy, the energy recovered from the air-stream and the latent energy gained from the dehumidification process is combined and fed to the refrigeration condenser which is thereby heated. The cool dry air from the evaporator passes across this heated condenser before being passed back into the room, dry and warm. The moisture collected from this process is fed away to waste. Our desiccant dehumidifiers use moisture-absorbing materials like silica gel. They are used for when very low relative humidity is needed, work is being carried out at extremely low temperatures, a low dew point is essential, or for when the unit has to be ducted into the area that needs drying. Desiccant materials (such as silica gel) have a high affinity for absorbing water vapour. 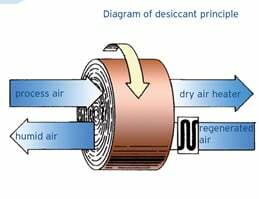 Today, most desiccant dehumidifiers use the desiccant material in a ’rotor’ form. Rotors are manufactured from alternate layers of flat and corrugated sheets impregnated with the active component (desiccant). This forms a vast number of axial air channels running parallel through the rotor structure. As air passes through these channels, moisture is transferred between the air and the desiccant. The component that contains the desiccant material (rotor), of which there are several types. A fan to move the air to be dehumidified (process air) through the desiccant rotor or material. A fan to move hot air (reactivation air) through the desiccant rotor or material. A heater to heat the air that is used to regenerate the desiccant material. A mechanical device to slowly rotate the desiccant rotor or material bed. Our desiccant dryers have capacities of up to 5,500m³/hr. The units come equipped with mounted particulate and oil-removal pre-filters, automatic condensate drains and an after-filter that cleans outlet air down to .01 micron. Our solutions typically comprise of all the necessary instrumentation and ancillary operations and can also be matched with air compressors and after-coolers, together or separately, to provide a total drying solution. Which dryer should I use, and when? Refrigerant dehumidifiers are best suited to large building sites where there is a need to accelerate the drying of plaster or concrete. By deploying a refrigerant unit in this scenario, end users are able to ensure that delicate drying processes are completed without surfaces cracking or shrinking before the composite has set properly. Desiccant units are typically used in areas where dry conditions are essential - such as pharmaceutical and petrochemical applications - due to their ability to produce low levels of humidity. Our desiccant products are also purposefully selected for drying out areas where access is restricted, such as storage tanks and marine environments.